Waiting on Wednesday is a weekly meme hosted by Breaking the Spine. Each week participating blogs feature upcoming titles that they’re eagerly anticipating. This isn’t a meme I do very often, but there are just so many sequels coming out this year that I’m dying to get my hands on. 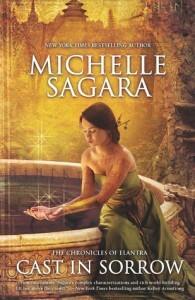 This week, the book I’m most looking forward to reading is Cast in Sorrow by Michelle Sagara, which is Book Nine in The Chronicles of Elantra. Book eight and nine were originally planned to be one story (and book eight was SO incredibly imaginative), so you can understand why I’m dying to get my hands on this next installment. And then the real trouble starts. Kaylin’s assignment is to be a “harmoniste”-one who helps tell the truth behind a Barrani Recitation. But in a land where words are more effective than weapons, Kaylin’s duties are deadly. With the wrong phrase she could tear a people further asunder. And with the right ones…well, then she might be able to heal a blight on a race. Only 153 days to go!